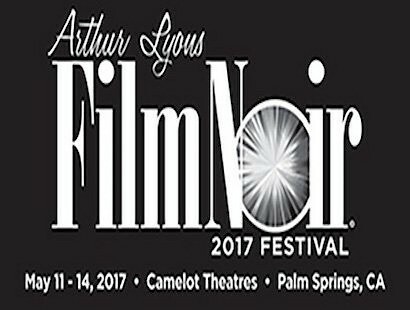 The program for the 2017 Arthur Lyons Film Noir Festival is set, with tickets and passes now on sale online at ArthurLyonsFilmNoir.org, or in person at the Camelot Theatres in Palm Springs. The festival, which is executive produced by the Palm Springs Cultural Center, is presented annually at the Camelot Theaters. This year, the festival will kick off on Thursday, May 11th and continue through Sunday, May 14th. “For our 18th year, we are presenting an extremely diverse line-up of films,” said festival producer and host Alan K. Rode. Other scheduled films include stirring performances by noir icons Dan Duryea and Richard Widmark, what Rode claims is “Boris Karloff’s finest screen performance” and a rediscovered gem by the great William Cameron Menzies. “I am particularly excited about this year’s special guests,” enthused Rode. The opening night screening of a restored print of Hollow Triumph includes an appearance by actress-filmmaker Monika Henried, daughter of star Paul Henried. In keeping with the festival’s established tradition, the majority of the film screenings are presented on archival 35mm prints with Rode and co-presenters Eddie Muller and Foster Hirsch introducing the films.